Light gun games have a special place in my heart. They provided a great thrill in the arcades when I was a kid and still do the trick to this day. (I just played a few rounds of House of the Dead III in the arcades last weekend). 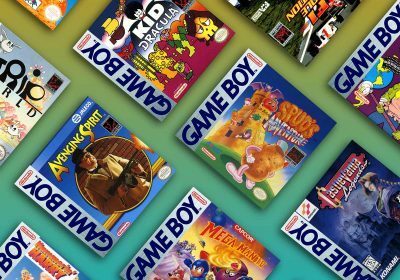 Also, after writing my recent piece on how the Nintendo Revolution will possibly revive the Light Gun genre with its motion-sensing controller, I thought now would be the perfect time to run down some of my favorite light gun franchises. Granted, many of the early games didn’t have much depth to them, but they are still fun for a quick game and are high on the nostalgia factor. While I obviously won’t cover every great gun game, I hope to tackle the best light gun games and will let you share which ones you think would be great to bring to the Revolution — either by official retail release or through the Nintendo Virtual Console. Yes, the one we probably all started with. 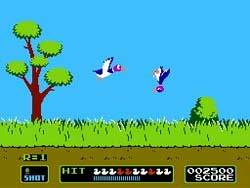 Duck Hunt was simple in terms of both graphics and gameplay, but the NES pack-in game had such an iconic charm about it, that it isn’t far behind the original Super Mario Bros in the minds of nostalgic gamers. I can still remember wanting to go over to my friends house when I was in elementary school just so I could play Duck Hunt. Nobody could deny that it would be cool to pay a couple bucks to download Duck Hunt on their Revolution and shoot with the controller. Maybe Nintendo could even add in a bonus Shoot-The-Dog mode to make a certain segment of the gaming population happy. 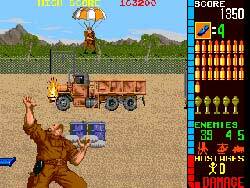 As one of the first arcade games to feature a mounted machine gun, Operation Wolf puts you in the shoes of a solider shooting everything and anything in sight. Instead of taking single shots here and there, Operation Wolf allowed you to mow down your enemies with wave after wave of rapid-fire. In addition to the machine gun, you have a button to throw out some grenades and take out even more baddies.. Overall, it was pretty simple, but still a lot of fun — especially with the machine gun. 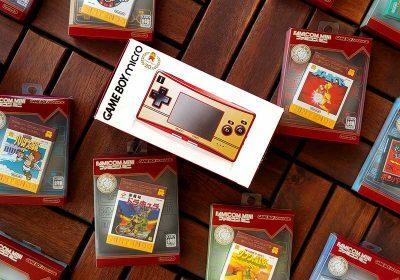 Unfortunately, it’s rather difficult to bring the experience to home consoles. The old NES port definately did not do the game justice, and Operation Wolf was also included on the Taito Legends compilation for the XBox and PS2, but they only used the analog stick which resulted in the extremely lacking game session. I’m not sure if the Revolution controller would be much of a help. Other similar machine gun games included Terminator 2: Judgment Day, Sega’s Jurassic Park: The Lost World (both of which I enjoyed) and the infamous Revolution X. 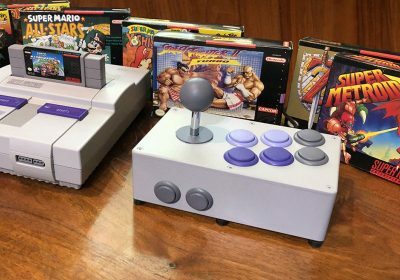 In a constant battle to out-do each other, both Sega and Nintendo developed their own large, custom light gun to add to the large collection of periphials for their 16-bit consoles. Neither one was very successful, but at least Nintendo actually used their popular charaters in a game to help sell the gun. Yoshi’s Safari required the Super Nintendo’s SuperScope as you play as Mario (riding on Yoshi’s back) via a first-person mode and must shoot at Bowser’s minions, as well as other objects and creatures. Again, the game wasn’t esspecially deep, but Yoshi’s Safari also had hidden areas and other secrets can be unlocked by shooting at the right place. It wasn’t very popular since the Super Scope’s use was pretty limited. But if there was a decent reason to pick one up, this might be it. Yoshi’s Island is also enjoyable if you are looking for an especially unique Mario game. The two-player action in Yoshi’s Safari is a bit limited as one person controls Yoshi while the other controls the gun. The game’s difficulty level is fairly low, but a few of the bosses can be challenging. Overall, Yoshi’s Safari is a fun and quick game if that’s what you’re looking for. Once gamers started looking for more realistic environments and targets to shoot at, Konami’s Lethal Enforcers was there to bring it home. The original Lethal Enforcers put you in the place of a police officer trying to fend off wave upon wave of typical bad guys. Lethal Enforcers II: Gunfighters was similar to the original except that it took you back to the old west as a local sheriff fighting off old-fashioned bank robbers. It was nice to see a stark change of setting instead of the same game with slightly different settings. The original Genesis and Super Nintendo ports of Lethal Enforcers weren’t too bad and would serve as welcome additions to the Revolution Virtual Console. My favorite version growing up, however, was the Sega CD version as the graphics were a bit better and the sound was much more realistic. While Lethal Enforcers has a more primitive video-capture technique, it inspired a number of light gun shooters that used motion video capture and were released on many of the early CD-based systems (Sega CD, 3DO, etc) such as Mad Dog McCree, Area 51, and Who Shot Johnny Rock. There were lots of light gun games back in the 90s like Lethal Enforcers that allowed you to play as some type of law enforcement. However, Sega’s Virtua Cop series brought that genre into the 3D world. The original Virtua Cop was released in the arcades in 1994 and was also ported to the Saturn. Just like Virtua Racing and Virtua Fighter before it, Virtua Cop revolutionized a genre and brought more people to the arcades. Virtua Cop had some very sharp but relatively blocky graphics in addition to some terrific animation and physics. For the first time, your enemies and they objects around them would react differently depending on how you shot them. Virtua Cop 2 enhanced both the graphics and gameplay a bit and also received a Saturn port and a later Dreamcast and PS2 port as well. In Virtua Cop 2, you can actually shoot things that benefit your cause in real life. For example, if there is a car full of criminals driving past you, simply blow out the tires of he black car speeding away and they will all be done for. You can blow up barrels that will take out entire screens of enemies and more. You will actually find yourself exploring the possibilities. After years of being missing from the arcade scene, Virtua Cop 3 was released in both the arcades, but only had a rumored XBox release. It was a vast graphical improvement over the previous installments and added some features, including some Matrix-style effects. While the first two Virtua Cops might not seem that amazing anymore after most gamers have been exposed to other similar shooters like Time Crisis, it would still be both an exciting and nostalgic compilation if Sega bundled all three games for the Revolution. 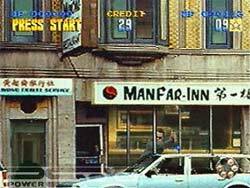 While Virtua Cop was lighting up the arcades with its 3D wonderland, Namco couldn’t just stand by and be out in the cold. Its answer to the 3D shooter was the Time Crisis series. The biggest innovation for Time Crisis the foot pedal found on the arcade machines that controlled whether the player’s character ducked behind cover or was standing up with guns a-blazing. It added a more realistic (and thrilling) element to the game and contributed some depth and strategy as well. Time Crisis also featured a countdown clock which could be recharged by clearing an area of “bad guys”. This forced the player to take risks and stay up and vulnerable most of the time, shooting quickly at any enemy he sees. Time Crisis 2, in addition to getting a nice graphical boost, introduced two player cooperation and allowed each player to cover the other. Time Crisis 3 built on 2’s features and added a new type of weapons system allowing the player to switch between the standard handgun (the only weapon with unlimited ammo), a fully automatic machine gun, a shotgun , and a grenade launcher. As you can see, the Time Crisis series had matured nicely bringing a very solid shooting experience. 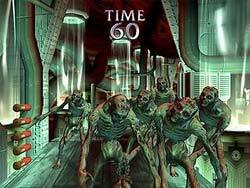 The original House of the Dead gave shooter fans a new breed of targets and brought zombie-a-plenty to the light gun shooter genre. The original House of the Dead was ported to the Sega Saturn. 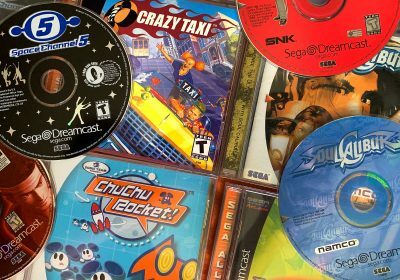 Three other arcade sequels have followed along with Dreamcast (part 2) and Xbox (part 3) ports afterwards. House of the Dead was one of the first light gun games to incorporate the possibilities of multiple routes. Your skill in protecting civilians can determine if you get into the main buildings or go a more undesirable route. There are other critical points in which the players’ actions decide where they go. House of the Dead 3 made an especially strong impact on me in the arcades. Unfortunately, the big rifle will be missing from the home ports. It really added to the atmosphere of the game when you’re holding a relatively large weapon in your hands and pump the gun to reload (instead of shooting off of the screen in older games). Maybe somebody will develop optional add-ons like IGN’s concepts. This series took the shooter genre and gave it a different spin. Silent Scope puts the player in the shoes of sniper during a series of terrorist incidents. This time around however, the gun is mounted to the arcade machine, requiring players to physically alter their position to shoot. Unfortunately, this setup is a little harder to translate to a normal console with a light gun. In fact, it wasn’t until the XBox release of Silent Scope Complete that a console version had light gun support at all (unless you count the Dreamcast port with certain types of guns). Even though it wouldn’t be able to completely reproduce the arcade experience, the Revolution controller should be able to get the functionality down of the scope. Like Sega, Namco has more that one great shooting franchise in its arsonal. The Point Blank series is basically a videogame representation of an interactive shooting gallery and puts more of an emphasis on solving fun puzzles instead of stopping bank robbers. The first Point Blank was a game that packed a ton of replay value and some incredibly fun gameplay. 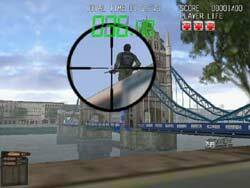 Point Blank 2 and Point Blank 3 was the same but had different shooting games, and even better gameplay. 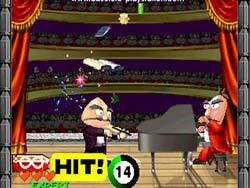 Namco will be breaking away from the Playstation with a Nintendo DS version. That gives us hope that a Revolution version may not be far behind! 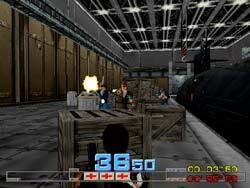 While Sega had House of the Dead 2 for the Dreamcast, they also wanted to have a more mainstream shooter without staying with the traditional Virtua Cop setup. Instead they put a bit of a James Bond spin on the genre and came up with Confidential Mission. 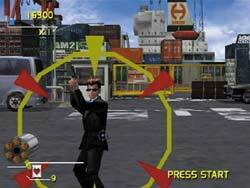 Without a doubt, the presentation of Confidence Mission is leaps and bounds above previous Virtua Cop games, with each of the three scenes telling a consistent storyline and making the experience very much like an action movie on your Dreamcast. Each mission has a decent briefing about the objectives, and there’s loads of cinemas and dialogue setting up the action all throughout each adventure. Its a shame that Confidential Mission didn’t get much attention, but it would be great to see it bundled with a Virtua Cop collection. While it’s not a typical light gun game, this cult classic from Konami does have support for a light gun. Heavily inspired by Blade Runner, Snatcher is an RPG-like adventure game that is developed by Hideo Kojima and the other people behind the Metal Gear Solid series. In addition to the adventure-style gameplay, Snatcher contains action sequences in which you shoot down incoming Snatcher robots or other enemies. Playing with the standard controller for these scenes is very easy, but the real fun starts if you have the Justifier light gun that came with Lethal Enforcers. It really adds to the atmosphere when you get into a dangerous area, have to throw down your controller and pick up the Justifier to shoot at whatever enemies sneak up on you. 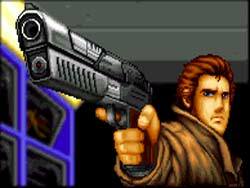 As I mentioned a couple of months ago, Hideo Kojima may be interested in bringing Snatcher to a modern gaming device. Perhaps the Revolution could be a nice fit. There are plenty of other shooters out there, but I’m sure I missed somebody’s favorite. Feel free to take a look at Wikipedia’s listing of each console and their respective light gun game library. I would personally LOVE to see an updated version of Elemental Gearbolt as that was one of my favorite PS1 games. However, since Working Designs went under, I seriously doubt we would see it. 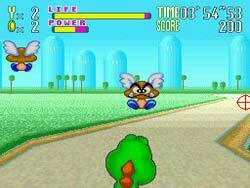 I use to play that at the arcades. It was great you could choose where you wanted to go next, then when you got there say there was a table, you could flip it over & use it as cover. My personal favourite is house of the dead 2, maybe the best lightgun game ever made. In the DC version they also added the rumble feature, so it’s a rock on when i invite people home. But in fact there are lots of good shooters, just look at this great list! Actually, Lethal Enforcers did not inspire any of the American Laser games (Who Shot Johnny Rock, Mad DogMcree). These were present in arcades before Lethal Enforcers hit the scene. Just wanted to point that out. 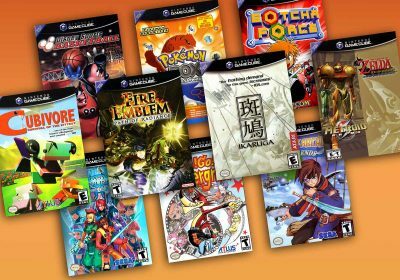 Otherwise, a good roundup of potential Wii titles. I can’t wait for Duck Hunt 2! Really? I guess my memory was bad. 🙂 Or maybe I just never saw those ones until later. You included Yoshi Safari but not Metal Combat? If you’ve never played Metal Combat you must give it a try. It is one of the more exciting Superscope games. why arnt there so meany shooting games for the xbox ???? One game that deserves mention is Gumshoe for the NES. It’s a lightgun platformer! It deserves mention for its uniqueness, and though it’s tough at first, it’s actually fun to play. is there a lcd gun for nes out there? has anyone played the lcd topgun? 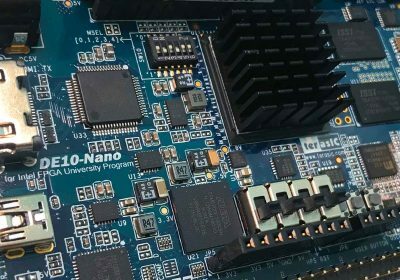 what all games will it work with(ps and ps2)? I’ve got a question that I can’t seem to find an answer to. Does anyone here know if the guncon 2 on PS2 will work with some of the PS1 lightgun games like Lethal Enforcers and Area 51? I know there was another gun called the Justifier that was for the Sega/Konami games, but it plugged into the controller ports while the Guncon 2 plugs into the USB ports. Anyone have any experience or links to a site with info on this? Okay, does anyone of you know what the BEST lightgun to get for the US Dreamcast? Also….. do you know if the Sega Saturn Stunner Gun works on the Dreamcast (by using a converter) in playing Confidential Mission and House of the Dead? Any out there with success with this or know? I think what would be an idea for light gun games is to produce a special console just for light gun games. Have a collection on the hard drive and have a collection of brand new gun controllers that work with any TV type. Lightgun support for Silent Scope on the Dreamcast! You mentioned you can get this game to work with a dreamcast port…How? House of the dead 2 Rocks!! Well, it’s not support like you would expect in the arcade — it can move the cursor just by moving the gun. 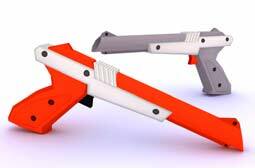 The special guns have D pad and buttons on them to control the cursor and then you can pull the trigger to shoot. So it’s not THAT great, but it’s an option. Whats the Pink Justifer worth? the one with the phone jack on the end of it? plugged into the bottom of the player 1’s blue gun?